Poutine. 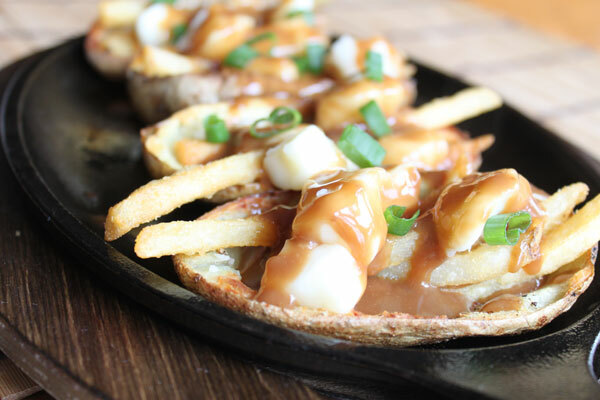 If you have never had poutine, you must seek and consume this wonderful recipe from Quebec, Canada. Yes, our friends to the north created this recipe where you have twice cooked fries, topped with cheese curds, and smothered in a brown gravy. It’s bar food at it’s finest. It’s messy, and it’s really, really good. I’ve been thinking about poutine for quiet some time now, and recently I decided to take the idea of poutine, but twist it up a little bit. This is where the poutine potato skin came into play. Once your potatoes are cooled, use a sharp bread knife and you will cut lengthwise. With a small spoon, being careful, scoop out about 70 percent of the potato, as you still want some potato in your boat. Next, melt your butter in the microwave. Get your broiler heated to high. Brush the butter on the inside and outside of each potato skin and place them back onto the baking sheet. Season the inside of each skin with salt and pepper. During this time, make your brown gravy by emptying the package into a small sauce pan and add 1 cup of water. Mix, and bring to a simmer. 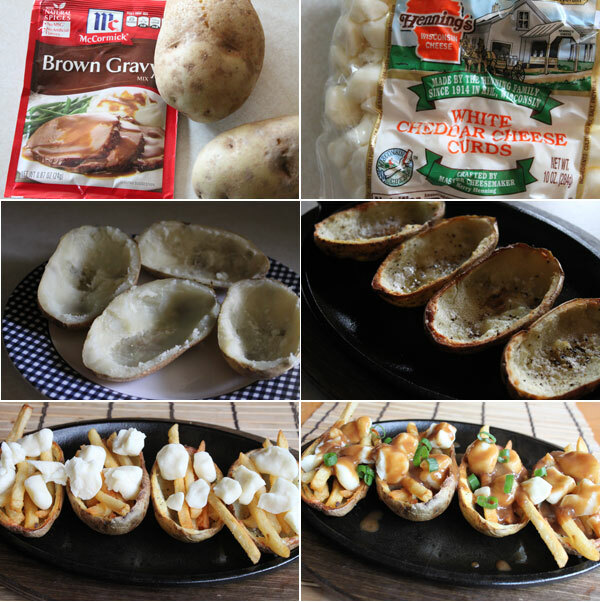 Once the potato skins are nice and crispy on the exterior, remove from the oven, and add a few crispy french fries into the bottom of each potato. Yes, more potato in a potato. Top with cheese curds, and pour on the hot brown gravy. Shower with sliced scallions if you desire. Lordy, Lordy, Lordy. Let me tell you. 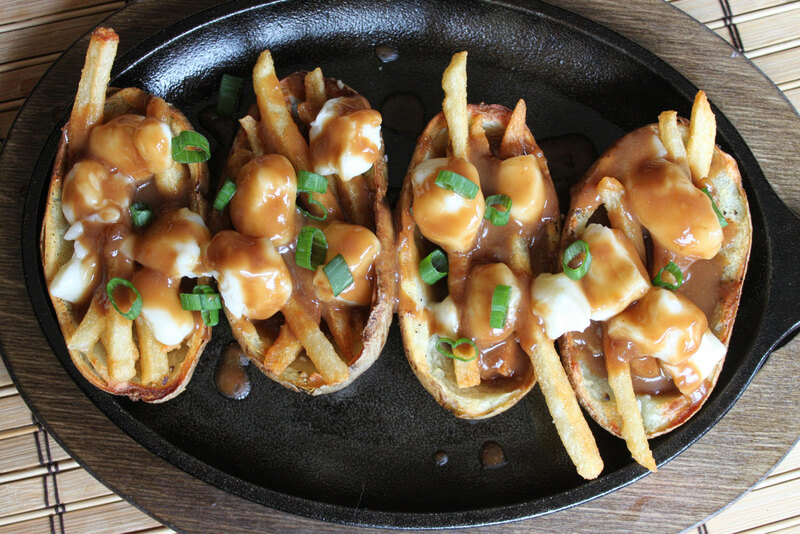 There is poutine, and there is poutine that just got a whole heck of a lot better. Not only are these a bit more mess free, but it’s the perfect vehicle to serve in. You get the nice and crispy potato skin, the crisp texture of the fry, and then those darn delicious cheese curds, still with some squeak, and the saltiness from the brown gravy. I’ll admit, I ate three of them. My kids had no interest (I should say my oldest), but my wife, who I was skeptical if she would enjoy these, LOVED them. Let’s just say I will be making these again soon. Hope you enjoy!